Nearly half of all Montana kids are growing up in low income homes. That’s according to the latest Montana KIDS COUNT policy report, put out by the Annie E. Casey Foundation. The report concludes it's going to take a coordinated approach to help lift kids out of those circumstances. The foundation publishes the report with the aim of giving lawmakers and children’s advocates data-driven policy recommendations to help children and families. Jennifer Calder is a Montana KIDS COUNT spokeswoman based out of the University of Montana's Bureau of Business and Economic Research. "We know that a child that's raised in poverty is more likely to become an adult living in poverty," said Calder. "We really need to figure out how to give these children a chance to succeed and we know that children succeed when families succeed." KIDS COUNT officials say government agencies usually view poor parents and children separately instead of as a cohesive family facing a unified challenge. It says too many families contend with inflexible, low wage jobs and a lack of early childhood education and child care. 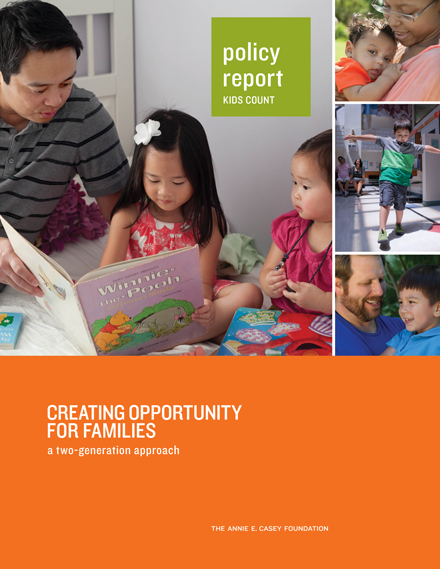 Jennifer Calder says the report, "Creating Opportunity for Families: A Two-Generation Approach" suggests entire families would be better served in one fell swoop. "You have to provide high quality early education while simultaneously building a parent capacity and skills so that they can both build their skills as parents and also build their skills so they can finish their education so they can get better jobs and so forth, So, both of those things need to happen simultaneously." Calder says that coordinated approach is already working in Montana and points to Bozeman's "Partnership Program" as one example. "So it's Thrive, which is a non-profit; the Gallatin Mental Health Center, the Gallatin City-County Health Department and high quality child care programs in the area," says Calder. "They meet regularly to talk about families. They say 'what are the needs of the family?' and then they figure out what service can meet those needs. It's been much more effective, this coordinated approach then, just say, having one organization, one program work with them, say home visiting, in isolation." Governor Steve Bullock will present the legislature with a proposed $37 million program, dubbed "Early Edge Montana," that would make block grants available to every school district in the state. That money would fund voluntary preschool programs. Public school districts could create a brand new program or partner with an existing local preschool. Calder says that program would help Montana families. Critics wonder about its expense and value to taxpayers. A new report produced by the Annie E. Casey Foundation concludes Americans should do more to promote early childhood education. It’s summer in Montana – that means so much to celebrate about living in beautiful Big Sky country: our lakes and rivers, mountains and trails; glorious national parks, a festival a week to enjoy. Montana is a great place to live. So I feel almost guilty in dropping a wet-blanket fact: Montana is a great place to live, depending on who you are. Governor Steve Bullock's early childhood education proposal received an enthusiastic response today at a Missoula pre-kindergarten program, even as critics are wondering about its expense and value to taxpayers. Governor Steve Bullock says it is time to give every four-year old Montana child access to a high-quality, early childhood education. It is one of the priorities of the Bullock Administration going into the 2015 Montana Legislative session. Bullock kicked off the "Early Edge Montana” initiative with stops today in Hardin and Billings. He'll be in Helena and Great Falls to talk about the program Tuesday, in Missoula on Wednesday, and Bozeman on Thursday. Lieutenant Governor Angela McLean will visit Browning to talk about it on Thursday.